Fudge made the traditional way is a pain. You know, you combine sugar with other ingredients in a saucepan and heat the mixture until it reaches that elusive “soft-ball” stage. The whole process requires constant attention — otherwise you risk scorching the sugar, among other potential bad things. Periodically you might even have to “wash” down the saucepan’s walls with a wet brush. How fun. Not. Once you achieve soft-ball nirvana, most recipes tell you to let the mixture cool undisturbed until it’s lukewarm (which can take a while). Then you get to stir (and stir) until the fudge sets up properly. If you make a mistake along the way, the fudge turns grainy. Or runny. Even if you don’t make a mistake, it often turns out wrong anyway (the humidity, you know). And the whole affair takes time, lots of time. A strong arm helps too. Fudge made this way is good, but it’s trouble. Enter the microwave. Fudge made in the microwave takes just a few minutes. It’s easy and almost foolproof. The result? A sweet treat that’s as smooth as the patter of a 3-card monte dealer. Before going further, let’s be clear: This isn’t a traditional recipe. Traditional fudge recipes call for sugar, butter, milk, and usually additional ingredients (chocolate is a favorite, of course). You heat the sugar mixture on top of the stove, and then mix in the butter by hand. Most of us don’t make fudge the old-fashioned way anymore because it’s too time consuming — and too difficult. Making a traditional-style fudge is challenging because you have to control two tricky variables: water content and sugar crystallization. 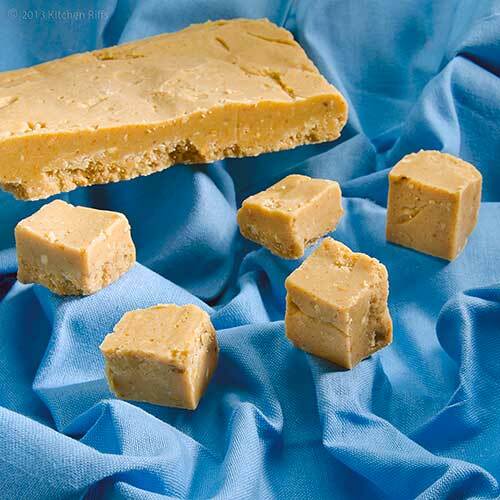 Water content affects the texture and appearance of fudge. Too much water? The fudge will be soft, even runny. Too little water? You can wind up with a sticky mess. That’s why traditional fudge recipes tell you to heat your sugar mixture to the soft-ball stage (which is about 240 degrees F) — because that’s the point at which you evaporate the required amount of water. After you heat the sugar mixture, you need to let it cool down. Which is where sugar crystallization comes in. If the melted sugar crystallizes too fast, its texture becomes coarse and gritty. And unfortunately, unless you’re a very accomplished candy maker, it usually crystallizes too fast. That’s because you can inadvertently set off crystallization by jiggling the pan too much, or allowing dust to touch the mixture, or whatever. Once your misstep allows a few sugar “seed crystals” to form, they create a chain reaction that turns your fudge into a grainy mass. Who needs that kind of frustration? Instead, most of us opt for shortcuts. Like this recipe. It allows us to enjoy the deliciousness of some favorite fudge ingredients (butter! sugar! ), without the hassle. The flavor may not be exactly like your grandmother’s homemade fudge. But it’s still darn good. And you don’t need a candy thermometer. This recipe is adapted from one by Alton Brown. The recipe takes about 10 or so minutes of active time. Then you need to cool the fudge in the refrigerator (so it can solidify) before you cut it. Figure on about two hours for that (you can speed things up a bit by putting it in the freezer for a few minutes; see Notes). Yield depends on how large you cut the pieces, but figure about five dozen 1-inch pieces. Leftovers (ha!) keep in an airtight container for a week or so. Store at room temperature. Butter an 8 by 8-inch pan and line it with parchment paper. Butter the parchment paper. Combine the peanut butter and butter in a large microwave-safe bowl (a 2-quart Pyrex container with lid is perfect). Cover with plastic wrap if you don’t have a lid for your container and you’re worried about “explosions” (optional, but not a bad thing to do). Microwave for 2 minutes on high. Stir, and then microwave on high for another minute or two, until the mixture is fully melted (microwave times vary). Caution: Mixture will be very hot when you remove it from the microwave. Add the vanilla to the melted peanut butter mixture and stir in. Then add the powdered sugar and stir to combine, using with a wooden spoon or spatula. The mixture will become fairly stiff and hard to stir. Spread the mixture into the prepared pan. Cover the surface of the fudge with additional parchment paper. Refrigerate until chilled and firm (you can cut it after an hour, although it will crumble; chilling about 2 hours is better). Turn chilled fudge onto a cutting board and cut into pieces of about 1-inch or so each. We buy peanut butter that contains peanuts and salt only, no added sugar. We haven’t tried this recipe with peanut butter “spreads” that contain sugar, but they should work OK.
We like crunchy peanut butter in general, so that’s what we always use in this recipe. The texture of the fudge is thus a bit crunchy — but we like that. Speaking of texture, although this is a pretty smooth fudge, it isn’t quite as smooth as chocolate fudge made in the microwave (or the traditional way). That’s just the nature of the peanut butter. We find this fudge plenty sweet, but you could add another couple of ounces of powdered sugar if you’d like (the original recipe calls for 16 ounces). Pure vanilla extract is made by soaking vanilla beans in a mixture of water and alcohol for several months. BTW, the FDA requires that pure vanilla extract contain at least 35% alcohol. If the label doesn’t say “pure,” that means it’s made from synthetic vanilla. The artificial kind is usually derived from the sapwood of several species of conifers — or from coal extracts! How appetizing. If you’re really in a hurry to eat this and can’t wait the hour or two for the fudge to chill in the refrigerator, you can stick it in the freezer for half an hour or so (ask us how we know this). Results are OK, but the texture is better if you refrigerate. Unfortunately, some people suffer from food allergies, and peanuts are a particular hazard. This allergy is relatively rare, but children seem to suffer from it more than adults. 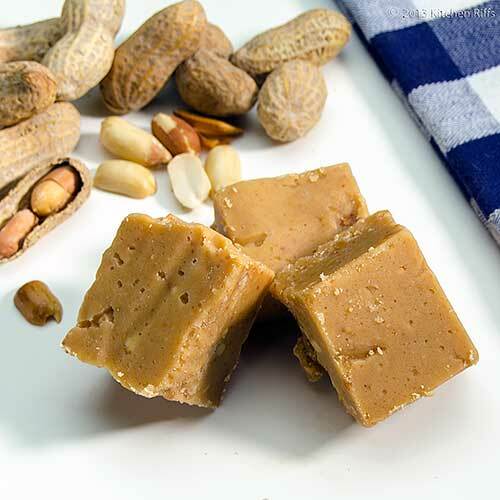 Among particularly susceptible children, simply being near peanut butter — say, sitting next to your child as s/he eats a piece of this fudge — can cause an allergic reaction. If this is a concern, you may want to serve this fudge as a weekend or afternoon snack, rather than packing it in a school lunch box. The good news is that most people don’t suffer this allergic reaction. So take prudent precautions, and enjoy these tasty morsels! “Great fudge,” I said, taking another piece. I don’t think I like where this conversation is going. I love quick and easy recipes! Especially when the main ingredient is yummy peanut butter! Very funny. And this sounds so good. My husband is a BIG peanut butter lover. H Natalie, can't go wrong with peanut butter, can you? :-) Thanks for the comment. Hi Abbe, if your husband loves peanut butter, he'll be in heaven with this recipe. ;-) Thanks for the comment. Oh my husband would love this. Great tips and photos but you're the master at that. YAY, I have been searching for this kind of recipe for so long. I am really going to try this one at home. Hi Vicki, I think your husband deserves this, don't you? ;-) Thanks for the kind words, and the comment. Hi Uru, the microwave really speeds up and takes all of the work out of fudge making. Thanks for the comment. Hi Sketched Chef, this kind of recipe really works and is a lot of fun to make. Thanks for the comment. Hi Marina, we mainly use our microwave for reheating things, but it's great for making fudge and other candies; and it's absolutely the best way to melt chocolate. It's also good at cooking things with high water content like many veggies and fish, although I don't often use it for that. But I understand your sentiment! Thanks for the comment. Hi Judy, I agree it's a thousand times yummy! You'll have fun making this - and a lot more eating it. ;-) Thanks for the comment. Never ever tried it in the microwave. Saving this recipe for next weekend! I've been meaning to make pb fudge for my daughter...she loves the stuff. I'll have to try it with creamy Jif, but I bet it will be marvelous! Hi Alex, it's so easy in the microwave! I think you'll enjoy it. Thanks for the comment. Hi Lizzy, I suspect Creamy Jif will be fantastic! I can't imagine any kind of peanut butter not working in this recipe. Thanks for the comment. Hi Barb, Mrs K R adds a layer of chocolate sometimes, too. But then, of course, that's a different fudge. ;-) And a lot of Super Bowl games do tend to be snooze fests if one's team isn't playing. Thanks for the comment. I like the idea of foolproof fudge. Great opening photo, by the way. This sounds so much easier than the traditional fudge. 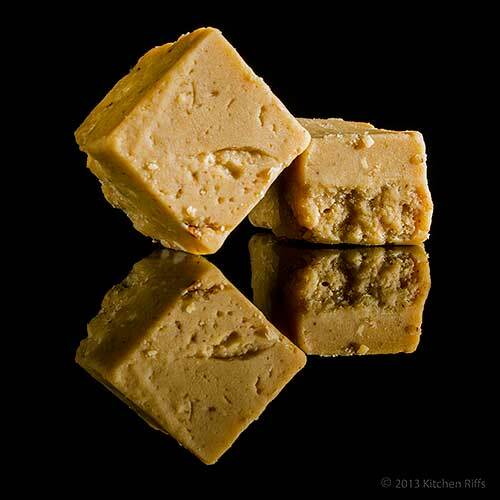 Peanut butter fudge sound great. Is that why some fudge is grainy? I always learn something here. I guess if you were allergic to peanuts you could use one of the other butters like cashew or almond. Hi Marina, I hear you! ;-) Game was more interesting than I expected. Hi Karen, this is about as foolproof as you can get! Awfully tasty, too. Thanks for the kind words, and the comment. Hi Dawn, it really is much easier. And the flavor is awfully good, too, as is the texture. Thanks for the comment. Hi Suzanne, that whole sugar/moisture thing is what makes some fudge turn out just wrong in texture - it sounds so trivial, but it's obviously important. I'll bet an almond fudge might be pretty good - something to think about. ;-) Thanks for the comment. My mother was one of those woman that could make the perfect chocolate fudge every time, but then she had lots of practice. She made A LOT of fudge. Having eaten so much fudge growing up it's not something that I crave to make. I have found other things to do with chocolate that are much easier. Now peanut butter is another matter. 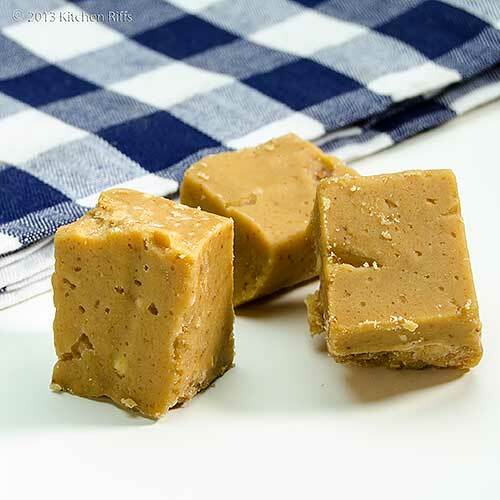 I do love this easy PB fudge that Mrs. KR has made!!! And most of all, I love how easy it is! 10 minutes? Really?!!? Oh, and she uses crunchy PB - so good! Mrs. KR is right - anyone who love PB and fudge will love this recipe! Thank you for this treat!!! Hi MJ, your mother was good! Obviously she knew her stuff. The microwave works pretty well for chocolate fudge, too, but I particularly like this PB one that Mrs K R is fond of making. And is there really any peanut butter other than crunchy? ;-) Thanks for the comment. I have never made traditional fudge (not a fan) but if I was going to, this looks much easier! Hi Carolyn, I'll bet most of us can make better fudge in the microwave than we can usually the traditional method. And this is truly good stuff - well worth the (minimal) time it takes to make. Thanks for the comment. Hi Alyssa, if you haven't made fudge, and need/want to someday, this really is the sort of recipe you should try - making it the traditional way does have pitfalls, and this one really doesn't have any. It doesn't sound as if fudge speaks to you, but if it ever does you know where to look. ;-) Thanks for the comment. Wow - so easy! I've made fudge, but not in ages (for exactly the reasons you described...). I don't have a microwave, but am adding this to the "when I do in the semi-near future" and "good to know" files. Hi Raymund, it really is easy and quick! And it goes fast - so make sure you get your share soon after your daughter makes it! Thanks for the comment. Hi Katherine, isn't this simple? And although the traditional method produces superb results, it really is such a pain. Hope you're able to get a microwave soon! Thanks for the comment. I make this fudge all the time and love it. It is even better with Biscoff instead of pb. Every time someone tastes it, they love it. Many people say it's the best fudge they've ever had. The photograph alone is enough to make me reach for the peanut butter...of course that it helps that I love fudge too! Thanks for the recipe! Hi Laura, the Biscoff is a great idea! We'll definitely have to give that a try. Thanks for the comment. Hi SallyAnne, fudge is such good stuff, isn't it? Glad you like the photo, and thanks for the comment. Hi Zoe, it's really a good recipe, and it is a huge time saver. Thanks for the comment. Hi John, sorry about that. ;-) Mrs K R has been doing a lot of fudge making lately, including plenty of chocolate variations. There will be more in the future. ;-) Thanks for the comment. Since I go through a jar of crunchy peanut butter a week all by myself (the natural Smucker's brand--I think I have a "problem" with it)--I will totally be giving this a go. At least my spoon in the jar will be put to rest for a while--thanks for the recipe share! Hi Kelly, a jar a week is pretty impressive! This fudge was actually made with the Smucker's natural stuff, so that is perfect. Enjoy! Thanks for the comment. I tried ( rather unsuccessfully) to make fudge the traditional way and it turned out a disaster! The colors of the gorgeous fudge with the blue background is so beautiful! Hi Daniela, this way is really easy - you'll be successful. Thanks for the kind words, and the comment. Hi Charlie, there's not a lot that we cook in the microwave, but this sort of dish works exceptionally well. It's fun, and easy. Have a great time making (and eating!) it. Thanks for the comment. Addictive! An interesting way of making fudge (I don't own a microwave, though). Hi Rosa, it's a great recipe, but of course it doesn't work if you don't have a microwave! And although the microwave is wonderful for many candies and chocolates, I sure wouldn't get one just for that. ;-) Thanks for the comment. Wow this looks faantastic! Super easy - I love microwave fudge! Hi Amy, I don't blame you for not liking to cook sugar - if you're not careful (and sometimes even when you are) bad things can happen! Thanks for the comment. Hi Christine, this really is easy. Tasty, too. ;-) Thanks for the comment. Hi Bam, isn't this fudge great? Might not rank up there with Makinaw Island fudge, but it's pretty tasty! Thanks so much for those very kind words, and for commenting. I have always wanted to try making fudge but the process seemed too complicated. Hee! Oh, you and Mrs. KR. I hope you had as good time with the superbowl viewing as you did with the fudge! I have to say...I might have to make a batch of this soon. You know, as post-superbowl consolation.....I won't say who I was rooting for, but it's gonna need a lot of fudge. Hi Nami, isn't this a nice recipe? Really, really tasty; and so easy. The first picture is pretty easy once you figure out your lighting. Just put the subject on black acrylic (which is a real dust magnet, BTW, so it must be totally clean, and even then you'll do some dust spotting in post production), black out any extraneous light, and bring the camera down fairly low (the lower the angle the more of the reflection you see). Thanks for the kind words, and the comment. Hi Ala, sorry you need some consolation! That was a pretty good game, though. Thanks for the comment. I've done toffee in the microwave but never fudge. With the toffee - you need to check every 30 seconds. This is a wee bit easier. I am saving this for my rare candy-making days. It would be fun to pair this with a microwave chocolate fudge recipe. Superbowl? Is that what was on against Downton Abbey? Hi Sawsan, microwaves are probably pretty safe although there are some concerns, and if you're bothered getting rid of it makes sense. Thanks for the comment. Hi Claudia, yup, the Super Bowl was on against Downton Abbey. ;-) What could they have been thinking? ;-) Making toffee sounds like fun - I'll have to tell Mrs K R (she's the sweets maker). Thanks for the comment. I'm with you - the few times I tried making fudge the traditional way was disastrous :P Thanks for the microwave recipe! I like that you used crunchy peanut butter for a fun texture versus the smooth. Hi Food Jaunts, we haven't tried making the traditional fudge for quite some time, but it's always a challenge. This is basically foolproof - just what we need! Thanks for the comment. This is a must try. I don't know anyone who doesn't love peanut butter, and if I can make it in the microwave with such simple ingredients, that's fantastic. Hi Kristi, isn't this just such a doable recipe? Too easy in some ways - you can make this any time, so it's really tempting! Thanks for the comment. Hi Sylvie, that's the worst thing about this recipe - it is dangerous because it's so easy to make! Heck, you even have time to make it on a "school night." ;-) Thanks for the comment. Hi Subhie, thanks for your kind words and your comment. Well, since I successfully made your microwaveable popcorn, I think some microwave fudge is in order! Hi Laura, the fudge is even better than the popcorn! Although I have to say making popcorn in the microwave is more dramatic. ;-) Thanks for the comment. Seriously? Microwave fudge?!? How have I not heard about this sooner! I can see a night of fudge ahead of me in my future. Hi Amanda, I know - this is evil, isn't it? But so good! You'll really like it, I predict. ;-) Thanks for the comment.